How sweet it is to be at Camp Towanda! Our week kicked off with a trip to Bethel Woods, a local attraction and spectacular concert venue, for the James Taylor concert (nothing like going to a concert with 200 kids!). Stephanie and I joined the campers, which was a real treat for us. We had a beautiful week of weather with so much to do packed into so little time. 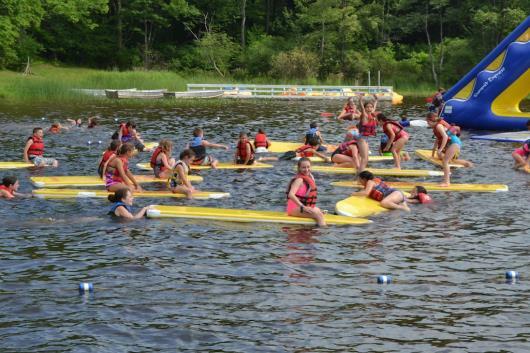 Activities, general swims, boating and canoe excursions, intercamp games, group photos, banana splits, trips to the Blueberry Farm (safari-style) and more! And that’s just during the day! The excitement is building for everything leading up to Visiting Day on Saturday…canteen craziness, music happiness, sportsmanship “achievementness” and group togetherness! It is Towanda Time here in Honesdale! We had our annual Venezuelan Pizza & Dance Party in The Mess Hall where Jared presented the annual gift to the campers and staff (Towanda Duct Tape they will take home at the end of the summer)! Girls Sing was simply an amazing display of emotion, spirit, sisterhood, healthy competition and creativity. Win or lose, it really didn’t matter; all the girls sang with the hearts and the boys were a respectful audience. 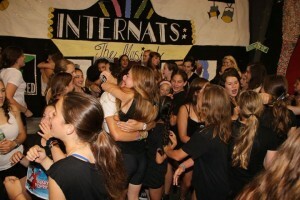 In the end, the Inters and Nationals “Internats the Musical” took 1st Place! Thankfully I am not a judge as it was all too close– from the Despicable Debs & Dills, to the Tweens & Junior’s Namaste to The Senior Night Fever and the incredible Sesame Street Dorm…GREAT! Even the boys’ audience had signs of encouragement for their corresponding groups. We ended the evening with a very special late night campfire with the Dorm Girls and Stephanie and I talked with them about their role, their responsibility and their growth. As the flames started small and grew, under the twinkling night sky an awesome shooting star flew above. The Dorm Girls began to reflect on what their final year as campers is all about…and with the loudest burst possible, they screamed their DORM cheer, it resounded thru the night sky as they walked back in the shadows of the night silently. Stephanie and I had lunch with the camp presidents this week (our white glove service was served by the 8 former presidents still at camp). Good fun! We needed to postpone our carnival because of weather and went indoors for a Karaoke Night and games followed by a pre-Olympic psychout gathering in the mess hall and impromptu Beatles Vs Rolling Stones Dance party that concluded with McDonalds served to the entire camp. Still one of my favorite things is driving up to the local Mc D’s and saying I’ll take 246 quarter pounders, 13 plain burgers, 197 cheeseburgers, 17 with no patty, and 1 big mac…to go…oh and can I get a toy with that and 26 extra ketchups. On Trip Day Thursday, the entire camp headed to Dorney Park, Wildwater Kingdom for a gorgeous day of rides and slides! And now it’s time to get ready for the big day TOMORROW!!!! Don’t forget to check out our latest Visiting Day issue of the Towanda Times here and look out for the latest edition of Friday Nite Flix, posted this weekend. And I have been told that we are sharing some of our highlight photos on Facebook…so follow us there too! Week 3 started off with a bang- when stormy weather caused us go indoors for Upper Camp’s roaring production of Queen’s We Will Rock You! The show went on and we all really enjoyed! We didn’t stop the music because Monday night followed with the Battle of the DJs! A dance party of epic proportions!!! We dodged some other showers on Tuesday evening to gather as a camp and watch the ALL STAR GAME live on the lawn on our extra-large outdoor projection screen in surround sound. 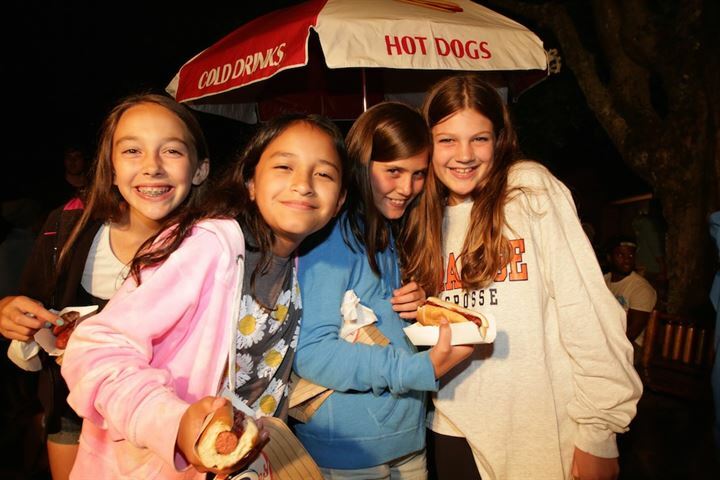 This is one of our favorite crazy nights, complete with Bob and Matt Miller grilling dogs, the Club boys hawking the dogs, Jared giving out Yankees popcorn bags from our vendor cart, Dorm girls serving beverages from the canteen window and Senior Staff acting as ushers at the game! The kids are busy enjoying culinary classes with Alumni Chef Ben- delicious, fun, educational. 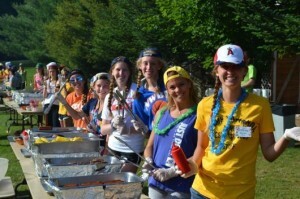 Recipes to follow at the end of the summer so you can make them at home and think of camp! The talented artists in Stephanie’s Fine Art’s class are becoming masters (of pride and art). 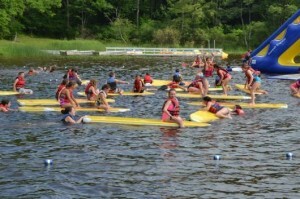 General swims have kids swinging, sliding, sailing, windsurfing and swimming! Another great evening activity this week was Electionality; our convention where each group comes as a “STATE” to cast their votes for the next Presidents of camp. State of “New Jerseys”, State of Selfies, State of Neon, State of Paper Plates and so on…… some very creative States…plus the state of the camp address and speeches by the candidates. All good fun which ended with the election of our first ever international presidents, Maria & Juan from Madrid! Their successful campaign endorsed by the Giddiap Poll used the tag line: “We’re Number Juan”! They have promised Tapas Tuesdays and changing the name of rest hour to Siesta Hour. Trip Day was wet and wild! Jets, Cadets, Debs & Dillies to Montage Mountain (lazy river and age appropriate water fun rides). 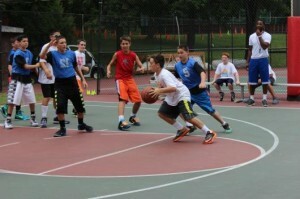 Middies, Tweens & Juniors to Camelbeach! And Upper Camp to HERSHEY PARK! And here we are now, completing the 3rd week of camp and I can only say this place is magical. 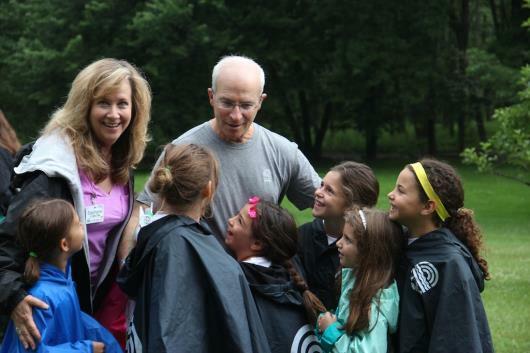 The experience of watching the young campers with the older campers, the mixed personalities, the varied interests and abilities, combined with the different backgrounds and upbringings funnel into creating this special “family” we all feel part of. This is the sense Stephanie and I have…everyone waves hello to each other, smiles are exchanged and we are overall the way the world should be. To think that camp will get better as the weeks go on is almost unimaginable. But we can’t wait! There is so much MORE in week 4! Stay tuned…we know you will! As many of you know, the tradition of Friday Night Services has always been a part of our weekly life at Camp Towanda. It is a time to reflect, grow and share as a family. 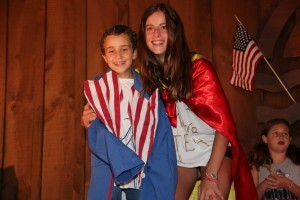 Last Friday, we had two campers from our oldest age group, the Club and the Dorm, share what camp has meant to them over the years. For these campers, Towanda has always been a part of their lives, even before they were born. Towanda runs through their families for generations and the love and appreciation they have for what it has given them, is evident in the words they shared with us. 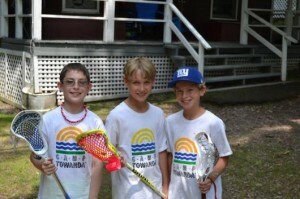 Camp Towanda has always been a part of my life, even before I came here as a Jet in 2007, 8 years ago. My grandfather, father, uncles and cousins have all taught me to believe in a place where “everybody knows your name”. Camp is a place where you make new friends with a bond that lasts a lifetime. I am proud to say that I truly care about every one of my brothers and sisters who sit in the back row tonight. 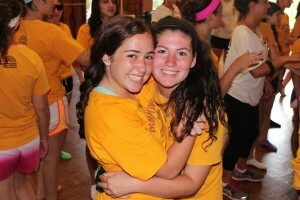 Camp has altered my life in a way no other experience has done before. 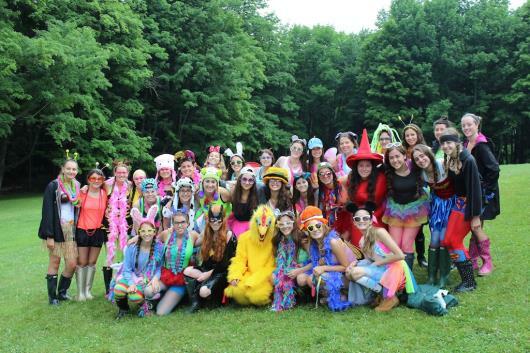 When people ask me what I love about Camp Towanda, my answer is everything. When you come into a new environment and you are welcomed with open arms, it’s a feeling like no other. Most people come up here and tell their story about how scared they were to walk off the bus. However, I was quite the opposite. After hearing the variety of stories spanning from breakout to Wayne County Fair, I couldn’t wait to arrive. 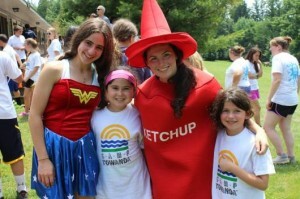 As I quickly adopted the Camp Towanda traditions and way of life, I never wanted to leave. As I reflect on my time at Camp Towanda, it seems crazy knowing that I’ve been coming here over half my life. 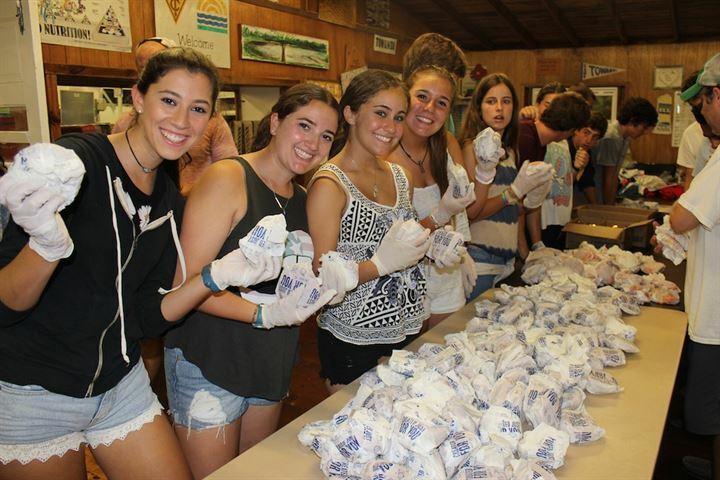 It’s an honor to keep the Seiden name alive here, as there has been at least one Seiden at camp since 1998. If you haven’t heard so already, prosper every moment because time really does fly by. Camp is one of the best places on Earth and being a part of it is something that I say with pride. I remember sitting in the front row looking at the Club boys in the back. After years of anticipation, I am now one of those Club boys and the feeling is nothing but surreal. 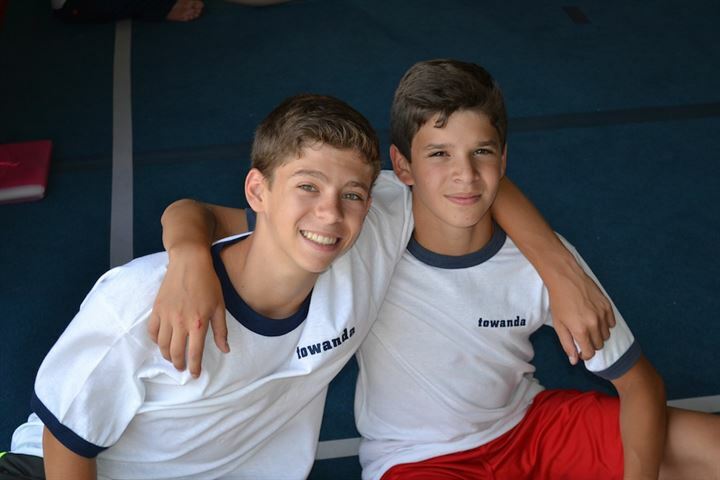 Towanda isn’t just a place you go, but somewhere that you are part of forever. I especially want to thank Mitch and Stephanie for being my summer parents for 8 years and counting. Thank you and Shabbat Shalom. My mom never fails to remind me of the importance of a support system. How she always had that “someone” throughout her life. Her support was always her camp friends, and they still are. 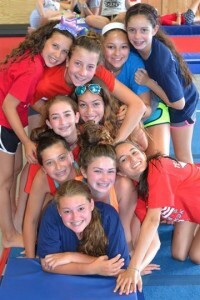 Not only am I lucky to have that same support, but also I have my whole camp family to lean on. 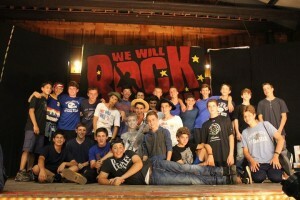 One of my favorite things about camp is that we’re one huge family. We watch each other grow up, have fun and are always there for one another. Towanda has been a part of my life for as long as I can remember and I have no idea who or where I would be without it. Camp has helped mold who I am today. 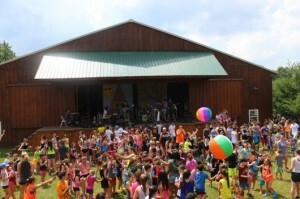 Camp taught me how to conquer my fears, to not sweat the small stuff, that there’s no point in being insecure, and to make the best of every situation, whether it’s riding a two wheel bike for the first time, having crazy dance parties all over camp or losing your favorite pair of shoes. Camp it’s my most favorite place to be. In the blink of an eye, I’ve gone from a quiet and scared new camper to a loud, confident and very excited Dorm girl. Camp has completely changed me for the better and I can’t put into words how appreciative I am for that. I now know I can cheer as loud as a blow horn, dance like nobody’s watching and put a positive twist on any situation I am in. The memories and friendships that I’ve made over the past several years are the ones that will last a lifetime. I cherish every single photo shoot, dance party and girl talk in the rec hall. I can’t wait to see what else camp has in store for me because let’s face it—the Millers aren’t going anywhere any time soon! I want to continue to grow at camp and help other people develop the same love I have for this place. 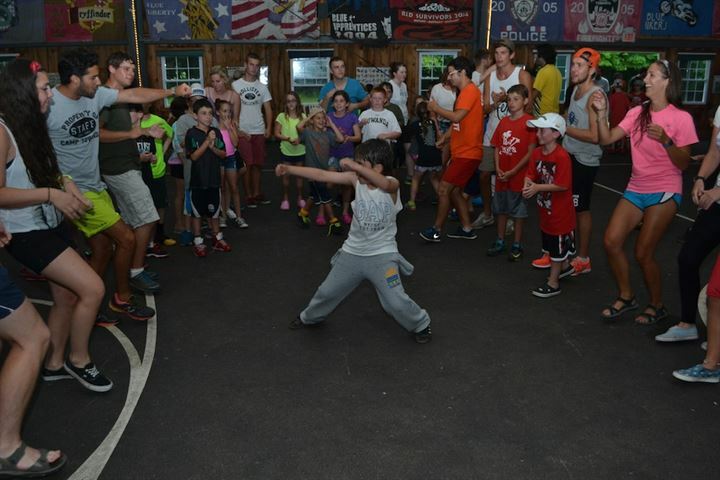 Looking back at my time at Towanda has made me so appreciative for the impact that camp has made in my life. Camp has provided me with life skills that not everyone is as fortunate to have. I would like to thank: my role model, Amy Miler [Girls’ Head Counselor] whose most meaningful title to me is being “my mom”, for pushing me to come to camp and for giving me this gift; The rest of my family that is here for their endless love and support; Mitch and Stephanie for making camp my true happy place; The Dorm of 2014- I love you guys more than anything and thank you for being my support system. My love for camp and my camp family is truly indescribable. If I could give you one piece of advice to everyone sitting here, it would be to cherish every second you have here because it goes by too quickly. 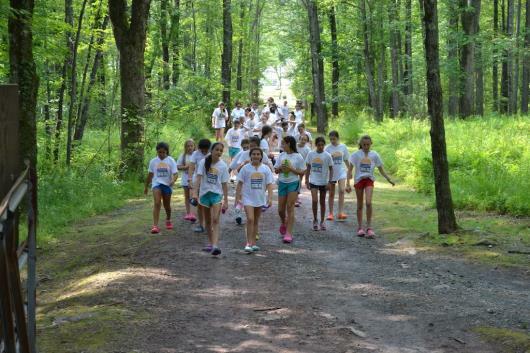 We’re into the third week of camp (WOW!) and camper phone calls have started!!! 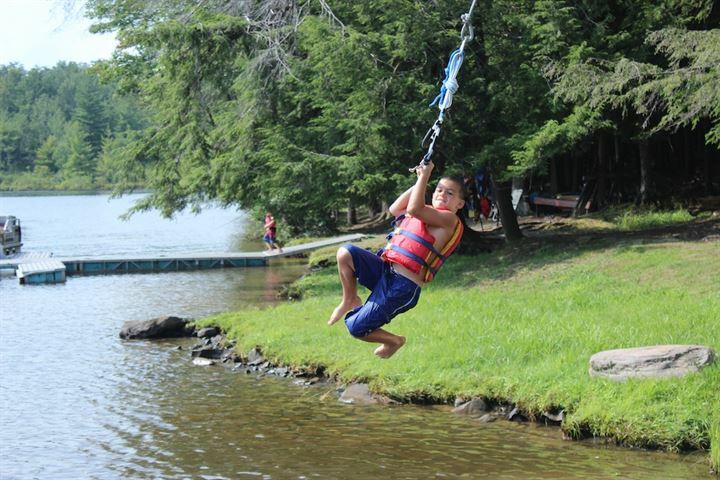 Hopefully your calls are the recharge YOU need to make it thru the next 12 days until you see your camper IN PERSON! Many of you have told us that your campers were eager to get back into the action and on with their day after your calls (like you were interrupting something more fun going on!). Kids! Their letters may be vague, but happy, and we can understand that as a parent, you want to know MORE. Like our campers, my net takeaway at the end of each day are feelings of pride, spirit and camaraderie and overall happiness. For them it’s sometimes hard to remember the exact activities they did during the day, the intercamps they played in, and the options they selected…because at the end of the day, they tried something new, felt great about themselves, made new friends and are ready for more. That’s what they remember and that’s what I remember. Because that’s the magic of camp, and what makes it SO different than every day life at home. The focus shifts from what you did TO how you feel and your overall experience and growth. There are a list of activities on our website and a typical day schedule. All our campers get involved in these activities and you can talk to your child and their counselors about them on phone calls and Visiting Day. Like all the traditional sports, Outdoor Adventure, waterfront, Gaga, Ghost, Arts & Crafts and more! Zumba is a big hit too (with the girls and boys!)! We change our schedule daily and no two days are alike!! Seriously. Subscribe to our iCal from the App. It tells you exactly what the evening activity was for the day and scheduled trips. I try to convey the essence of these activities in my emails, but you can get the gist from the pictures (which are always posted within a day or two of the event). When you come up on Visiting Day, you can take a peek at THE BOARD in the center of camp, which has info on group schedules, tournaments and daily life. Follow our Blog– a couple times a week, we update the blog by translating my nightly emails into ‘English’, helping give you a sense of the week or a special event like Olympics. General to camp, but sometimes more specific than my emails. Enough to help you talk to your camper about it. The Live Camp Cam! You can literally see what’s going on at camp! You can find out the weather and see the center of camp! Of course there’s a very good chance you won’t see your child, but you will see camp. Use our exclusive CT checkbox stationery. These are questions that speak to the activities, food and fun you can only find here! Available in your Campminder Docs. We understand it’s hard to go from being SO involved in your child’s day-to-day activities to feeling disconnected…BUT at the end of the day, we promise your kids are participating in a wide range of activities (literally all of them on our website), competitive/intercamp opportunities, evening activities and more! But most importantly, they are growing, maturing, and feeling great about themselves. Kids are kids…and not always the best communicators! 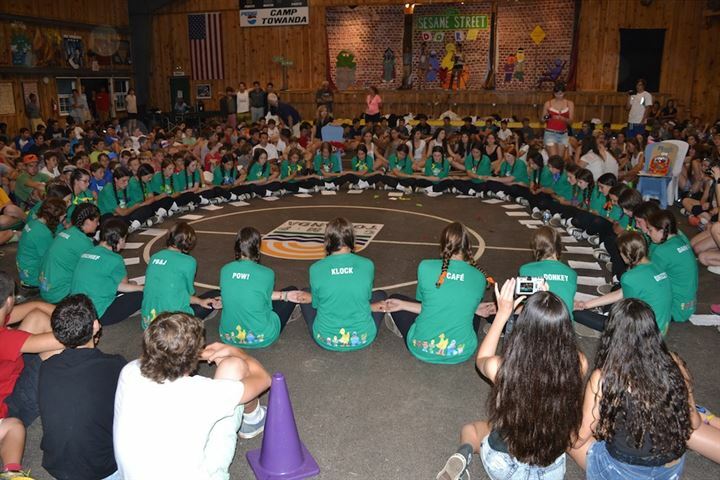 They are busy immersing themselves in life here at camp…which can sometimes leave them at a loss for words, and indescribable feelings…and that’s why we call it MAGIC. It’s the second week and we are hitting our stride. 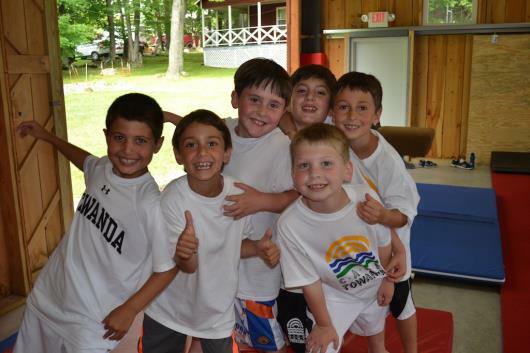 So many quintessential camp activities that are great traditions here at Camp Towanda happen in the second week. We started out with a Buffet breakfast on the lawn picnic tables, activities and “make your own sandwich” lunch outside. All of camp then hit the waterfront for our amazing water carnival with loads of rides, slides, cotton candy, popcorn, fruit, melon, great dancing and music. 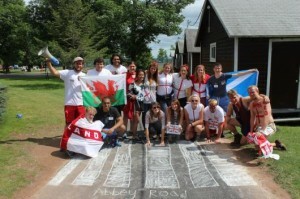 It was a warm sunny day that also featured a 10 minute rain shower that chased us all in to the boathouse (rain pounding on the tin roof while the girls sang as loud as they could to drown out the weather)…those are the things you remember most about camp! The unexpected moments. We then we went back out and continued the fun on the huge slides and rides! I couldn’t resist jumping in on the action…camp fun for everyone. If you could be here you would feel the energy. Always exciting, always fun, always loving, growing and getting closer…as a big camp family. I see the older kids with the youngest, I see piggy back rides, I see kids playing activities and singing and dancing…the spirit and attitude is wonderful…even those few campers who write home telling their parents they are homesick are up on stage, involved, have friends and are smiling…..when I ask them why they wrote such letters, they look at me and say something like…”oh, I really don’t mean that, I was just writing that because I miss them and I love it here…” Kids! The rest of the week was beautiful weather, late reveilles, activities, inter-camp games, culinary classes, yo-yo clinic, Stephanie’s Fine Arts Class and so much more! 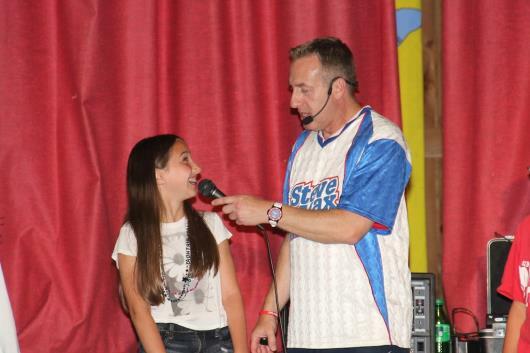 We had an all camp magic show and the return of the very talented Steve Max–a camp favorite activity of Simon Sez. Old fashioned-fun that delivers the message of RESPECT. We had our first official trip day this Thursday, bowling and the movies…or as the counselors say, “Ahhh, air conditioning”! The Nationals had a 3 day excursion in the Adirondacks and our camp family is back together as we head into another Friday…which means an evening of shabbat services and our second edition of Friday Nite Flix!!! Woooo! Our life at camp moves at a fairly quick pace; activity-to-activity; joke-to-joke; song-to-song and friend-to-friend. The real magic is that it all happens so naturally here; without intervention from the outside world. There is something special when one has a personal achievement, they can soak in the moment without searching for parental accolades from the sidelines. This is where we see growth, self-confidence and true healthy self-esteem build. It’s all happening here at camp…we’re enjoying every minute! Four days of 4th of July! 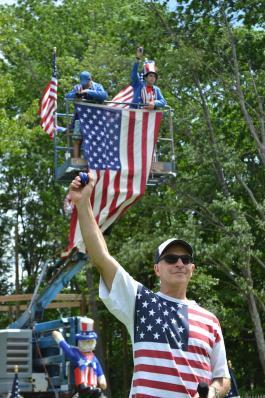 It was an action-packed FOUR days of activities, and tribute to the red, white and blue! We told you there was MORE in 20-1-4! We cannot believe it’s only been a little over a week because our campers are in the routine, having a blast and the spirit is high! It all started on Thursday with a foggy lawn breakfast buffet (did you see it on the Live Camp Cam? 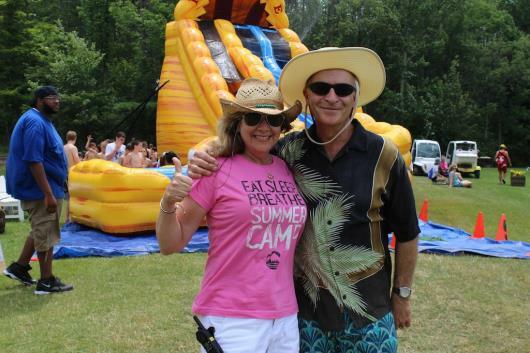 ), then we got in 2 activities, a sultry lunch and an awesome live CAMPAPOLOOZA concert in our amphitheater (complete with big beach balls, water hose, ice cream and the sounds of FIKUS blasting excellent classic rock and roll to our dancing crowd). As soon as the concert ended, we got some very specific lightning bolts jolting around our region. Our planning was right on target as we had already cancelled general swim due to our impressive weather staion with pinpoint lightning detection so everyone was already safely back in the bunks when the rain pummeled the already saturated ground…the rain and t-storms delayed dinner and our campers got some quality, relaxing time together in the bunks. We continued our July 4th festivities on Friday. The weather changed from sultry summer to dry and crisp autumn! A beautiful day of patriotic honors, co-eding, silly name day, breaking the Guinness Record for yo-yo ing and then Friday Nite Flix. We kicked off the festivities with the Jets and Debs’ Color Guard at Flagpole, a morning of fun Coed activities, an All-American chicken, rib & vegetarian lunch BBQ and then we all joined together to beat the Guinness Record of Yo-Yo participation; this was crazy fun and everyone received Yo-Yo lessons from our very own world champion Yo-Yo master, Dan Green (ranked in world competition) , returning for his 2nd summer. 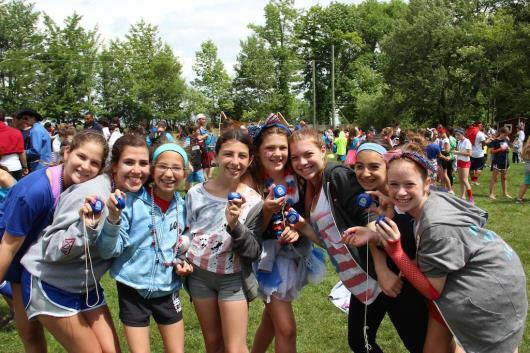 As a souvenir of the day, everyone got to keep their very own Camp Towanda logo’d Yo-Yo! Then the British Staff took over the newly paved road behind the Girls Bunk line and declared it forevermore “Abby Road”…the stripes will be officially painted in the coming days! One more coed activity then we had our weekly Friday night shabbos dinner, services in the Field House with the fireplace lit, Friday Nite Flix which played to a standing ovation and under-lined the totally immersed excitement we are living here; having fun, learning, growing and did I mention FUN?!!! Don’t forget to check out our Friday Nite Flix page for our weekly highlights. Usually posted on Saturday morning. I joined the oldest “CLUB” boys on Friday night for an after hours campfire; a very special gathering of the brotherhood from Club members of the past and now present. We can’t talk about it, but this ceremony underlines and reinforces the foundation of what these boys have gained over the years since they started here….and now they are ready to lead by example, spirit, trust, respect, confidence, balance and pride! 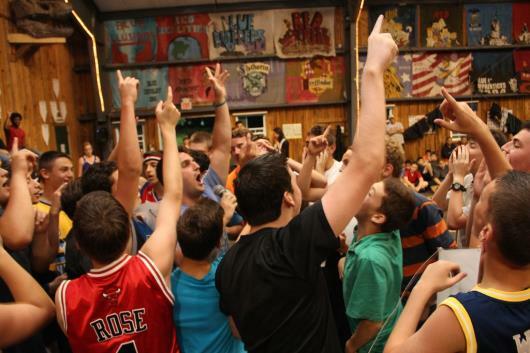 This is what this what growing up at camp is about… in an unplugged, old school way of life…. 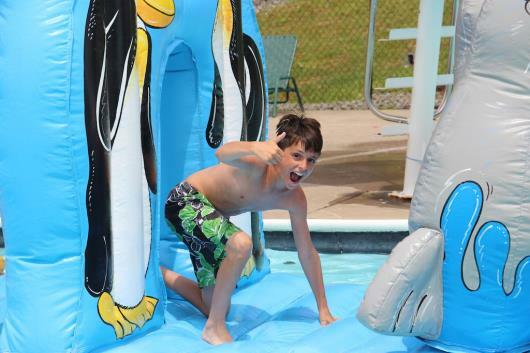 The weekend was filled with more fun, activities and new families starting to tour Towanda for Summer ’15. 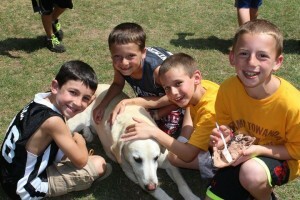 New campers and parents visiting tell us that Towanda looks, smells, sounds and feels like the way camp should be! Our kids and staff are smiling, active, look really happy and there is an overall sense of warmth and pride here……OMG and thanks! That is our goal…so it is nice to hear it from the outside looking in. I share that with our staff and it just helps them want to do even better! 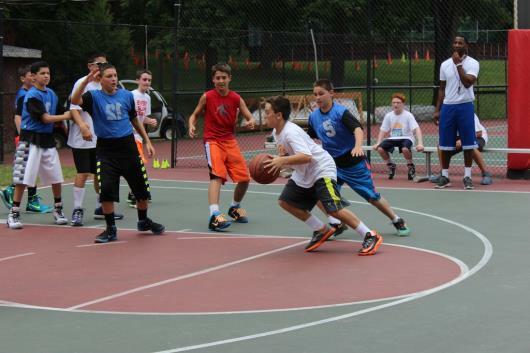 Saturday our campers put on a show that showcased their diverse talents! It was good fun and everyone cheered! Towanda’s Got Talent people! Sunday was a Top 10 weather day and certainly one of the best days at camp so far (that’s a bit unfair since every day gets better). 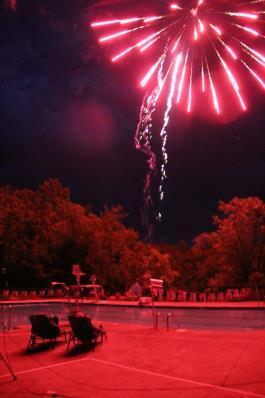 Activities, fun, Grateful Dead BBQ and Luau at Sunset Lake followed by our delayed 4th of the July fireworks which were just awesome…..set to Tchaikovsky’s 1812 Overture! It was a big sky of ooooh-ahhh-ohhh! Life at CT is amazing…watching everyone grow, get together and hearing the feedback from staff that tell me…”I love my kids and I cant believe I feel like I have made so many new best friends in such a short time”…well, that attitude just trickles down to the kids; we all feel it here. Did you go to summer camp? Do you remember “mail call”? This was a time when someone from your bunk ran down to the head counselors’ shack to retrieve your bunk’s mail. A counselor or camper would then distribute the mail around the bunk as you eagerly awaited a letter from home. You loved getting letters from home! Now do you remember letter-writing days? These were the times when you HAD to take a break from all the action and fun, and scribble down anything you could to fill a page and meet your requirement of sending a letter home. Do you remember writing a letter at night when you missed home? Or at rest hour when you were a little frustrated by a bunkmate, and the only person you wanted to tell was your mom? Or you just wrote “Having fun. Gotta go.” Can you imagine how your parents felt receiving those letters? It kind of makes you laugh right? You give the gift of sending your child to camp and in return, they check a few boxes on a small piece of stationery, squeeze out some sentences and hopefully remember to put a stamp on the envelope! By the time that letter gets to you (often days or a week later), the moment has passed, the child has moved on but you are stuck with this letter! Oh the joys of being a child (and a parent). We don’t want to make you think we don’t LOVE letter writing. We do for many reasons. Where else in modern times do people write REAL, handwritten letters every week and wait eagerly by the mailbox to receive them? It is an old art form of communication that is so important. It also is a valuable time for parents, grandparents, friends and children to think about each other without actually asking the other to do anything for them. It strengthens the bonds in your family and has the potential to be reflective, connective and memorable (has anyone read that book called “P.S. I Hate It Here. Kids’ Letters From Camp”?- it is laugh out loud funny!). It is for all of these reasons that we do suggest that you take the letters with a grain of salt. 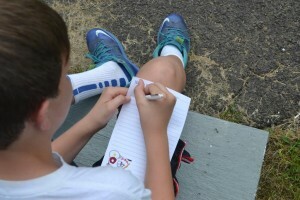 It is sometimes easier to remember an annoying little incident in a letter, than all the great things that are going on at camp. 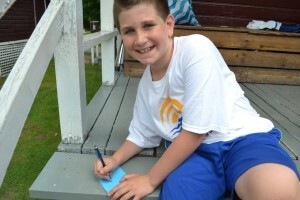 It is for this reason that we are so excited about our new Camp Towanda Check Box Stationery. Not only is it super-easy, eco-friendly and exclusive to our camp…it helps remind your child about all the great things that they are experiencing and want to share with their families! (Did you download it from CampMinder and print copies for your child to put in their stationery box? You can still send them some copies). Oh letters. Write them. Read them. But most importantly, SAVE THEM. They will make you laugh one day! And you can give them to your child when they are grown up and sending their kids off to camp! That’s called Camp Karma! 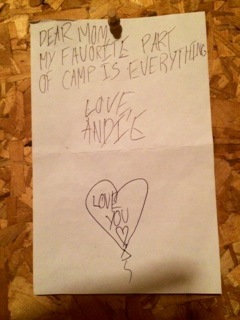 Do you have a hilarious camp letter (present or past) that you want to share for our collection? Send them to lauren@camptowanda.com. First time parents- looking for more advice from seasoned camp parents? Check out this blog from last summer. It features 3 letters from our veteran camp parents to first time parents about “the letters”. 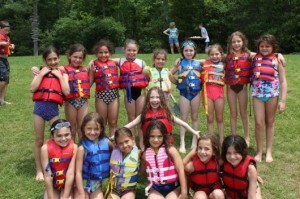 Camp Towanda is an independent, traditional, co-ed sleep-away camp in the Poconos in Pennsylvania. It is privately owned, operated and directed by Mitch and Stephanie Reiter (who are celebrating 25 years as owners and directors). For over 90 years, Camp Towanda has continued to define what camp should really be. 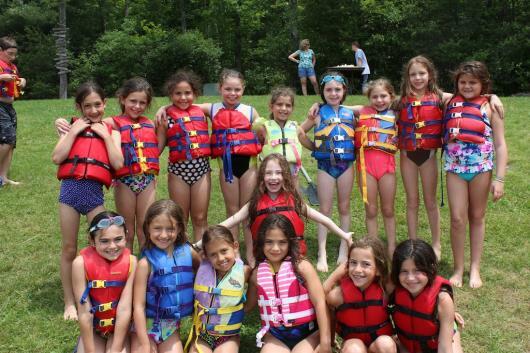 Our program offers state-of-the-art facilities, an excellent and professional athletic department, waterfront, extensive arts, drama and adventure programs, and special events. We are highly regarded and respected as an industry leader and are involved in giving back to various organizations throughout the year. Camp Towanda is accredited by the American Camp Association and a member of the Camp-Alert-Network, Wayne County Camp Association, Camp Owners and Directors Association and the Pennsylvania Camp Association. The Way Life Should Be! The 1st MONDAY started off a light drizzle then heavy rain, then warm, humid sunshine. We were in, we were out, but the overall feeling is very comfortable. Comfortable being AT camp! Our oldest campers, the Dorm Girls wore their Maniac Monday costumes, our youngest campers, the Debs were giggling, the Jets were cheering, the Club were grunting, the Dillies loved gaga; Tweens were awesome at soccer, the Junior Boys took advantage of our special LAX clinic, the Inter girls had tennis, the Senior Girls were doing the cardio workout thing, the LITs started getting into their community service projects (Foundation Fighting Blindness’ Visionwalk, SCOPE, Morry’s Camp) and the Nationals loved Ghost while the Junior girls had arts & crafts….. I think I got everyone here….those were at least are the activities I was hopping to and from! Stephanie has been enjoying time in the garden with the younger kids who are getting comfortable with our 11 chickens, 4 rabbits and 2 miniature horses. The kids think the chicken’s eggs are fake, but they are real Free Range Chickens!! Stephanie and I had a fantastic private chat with The Dorm Girls on their new “DORCH”; wonderful bonding moments. Each night a different group gets quality time with us and we love connecting in these quiet, sit in a circle, opportunities. The best part is that if you are a fly on the wall, you witness these older kids sitting, talking, laughing and with absolutely no cell phone or computer…and they don’t even realize they don’t have it! They tell me they love being unplugged. It is SO not an issue here. It is difficult to describe how great camp is, how special, how vibrant, how everything (from the rain on the roof, smell of campfire or sounds of great classic rock songs) is just …the way life should be! And we have only just begun…..here are a few of the highlight pix from Monday. Enjoy! Happy July.